Happy New Year! I would like to begin by wishing everyone the very best for 2014. 2013 was a bit of a disaster for me, car wise, so I am really looking forward to getting out and about with in my new wheels once the weather improves. The AV360PI has actually increased 4.35% MoM and now stands at 101.99. This means that average asking prices are now above the level from when I started collecting the data back in August. The increase is driven by the lack of cheaper cars on the market with the number of 360’s for sale on Pistonheads dropping from 52 in December to 32. Most of that has been from the bottom end of the market – the number of cars advertised at £45k or below has fallen from 18 to just 8. At the other end of the scale, there are a number of optimistically priced cars which are dragging average prices upwards. This includes the Frosts car at £70k which, interestingly, has suddenly acquired a few miles – in December it was listed with 6,188 on the odometer, now it is 7,388. 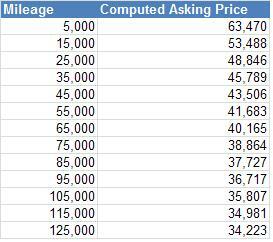 Here is the table of mileage vs average asking price as per the line of best fit. As the cheaper cars have dropped out of the data prices have crept up along the curve. It will be interesting to see what happens in the coming months. Personally I think that the bottom of the 360 market has been and gone and prices will remain firm for a while. Another factor to keep an eye on is how much mileage creeps up. 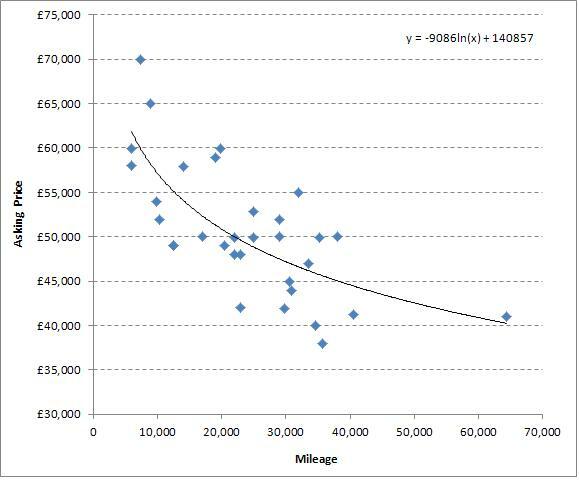 Since I started collecting the data, the median mileage of cars for sale has been around 24k (see table below). As the cars get used and mileages increase the effect on prices will be worth noting, especially once the 30k barrier has been breached. The 360 market has slowed quite a bit this winter, the lack of the Australian export market shows a return to the old seasonal pattern of sales volumes dropping off around this time of year. A large number of the cars for sale have been for sale an exceptionally long time – too long for 360’s. The prices for quality cars have remained firm but the top end of the reasonably obtainable market is around £52k – this is for a quality teen mileage fully prepared 360 which is a modest drop from the £55k not so long ago. The index does not take quality into account. The distance between a quality prepared car and an average 360 is getting wider and as time goes by and mileages increase I expect this trend to continue, which will not be necessarily reflected in the asking price. The next market indicator will be early March. If the weather is reasonably dry then prices will probably go back to where they were throughout 2013 but if the weather is poor then the price dip will hold (obviously the classic Ferrari market has a different trend). The overall dealer perspective is very promising in relation to market activity and attitude for 2014, only a shortage of demand will cause a market hiccup!